BROAD SPECTRUM HERBICIDE for selective control of weeds in sugar beets, garden beets, onions, garlic, shallots (in all states) and carrots in Washington and Oregon only. GRASS SEED HERBICIDE for selective control of weeds in certain grass seed crops and commercial sod production in California, Idaho, Nevada, Oregon and Washington. 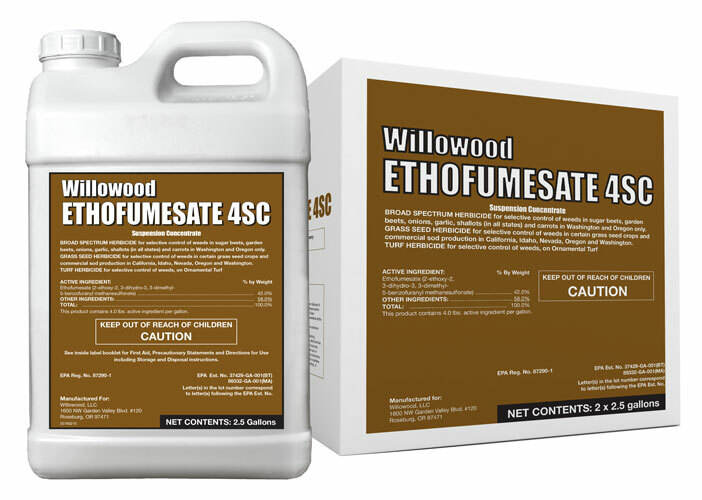 Willowood Ethofumesate 4SC provides an excellent weed control foundation with multiple application options. When used in cool-season turf, Willowood Ethofumesate 4SC provides both pre- and post-emergent control of Poa annua. In addition, Willowood Ethofumesate 4SC also controls a wide variety of annual grasses and broadleaf weeds. When used in conjunction with RoundUp Ready® sugarbeets, Willowood Ethofumesate 4SC provides an excellent foundation for the development of a weed resistance management program. This product contains 4.0 lbs. active ingredient per gallon. NORTON® is a registered trademark of BayerCropScience.